Lum and Abner was an American network radio comedy program created by Chester Lauck and Norris Goff that aired from 1931 to 1954. Lauck and Goff, childhood friends, modeled the show around small town life in Waters, Arkansas. The two men grew up in Mena, Arkansas and attended the University of Arkansas together. They started doing local performances of their blackface act, but eventually changed the act due to the large number of blackface acts already being performed. Though they ditched the act, it landed them an audition at Hot Springs, Arkansas radio station, KTHS. For the audition, Lauck and Goff decided to portray two hillbillies and landed a show -the Lum and Abner show. After only a few episodes, the show was picked up by NBC. Over the course of the show’s airing, it was also broadcast on ABC and CBS. 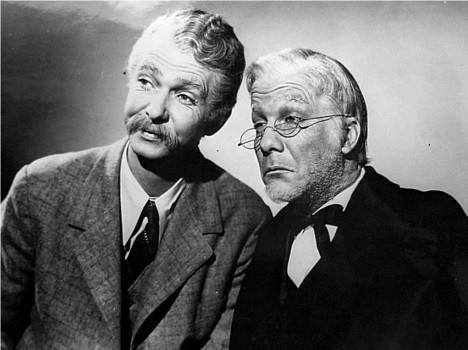 During their career, Lauck and Goff broadcast over 5,000 shows and eventually brought their characters to life on the big screen. Their film career included Dreaming Out Loud (1940), The Bashful Bachelor (1942), Two Weeks to Live (1943), So This Is Washington (1943), Goin’ to Town (1944), Partners in Time (1946) and Lum and Abner Abroad (1956). Today, the Lum and Abner legacy lives on in the Lum and Abner comic strip. The comic strip began in 2011 after members of the Lauck family and cartoonist Donnie Pitchford decided the old characters should be brought back to life. The comics are based on the storylines of the old shows and each strip is accompanied by music, sound effects and an audio dramatization with voices. The comedy duo is also honored at the Lum and Abner Museum in Pine Ridge, Arkansas and the annual Lum and Abner Festival in their hometown of Mena. The festival includes live music, local handicrafts, food vendors, live entertainment, historical reenactments and more! The 39th Annual Lum and Abner Festival will take place June 3-4. See More on the City of Mena’s website & Facebook page.